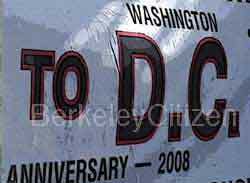 The first stop for the 2008 Longest Walk 2 was Berkeley's endangered Memorial Oak Grove on the university campus and site of a Native burial ground. They gathered to call attention to the tree sitters who have protected the grove and burial ground from the university's plan to cut the trees and develop the site. Wounded Knee De Ocampo and others spoke to the group of over one hundred outside the two barbed wire fences blocking entrance to the grove. 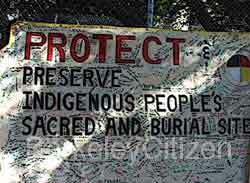 They also addressed the current court actions to protect the Native site and of the UC Regent's plans to further desecrate the burial ground. Ayr, Oak Grove ground supporter since the beginning, spoke briefly about the Native history of the area. He praised the courage of the tree sitters and commitment to the grove occupation. The tree sit was in its 437th day. The Mewuk elder called for the crowd to join the struggle to "protect sacred sites, our sovereignty, the environment, peace, justice" Wounded Knee then led the group to a 200-year-old Coastal Live Oak at the north end of the grove. He encouraged participants to offer their prayers. Save Mother Earth! A large community gathering was held at the Oak Grove tree-sit to receive those preparing to begin the Longest Walk.The journey to Washington D.C. from Sacramento will take about five month. The group hopes to raise awareness to the many environmental and cultural issues facing the country and Indigenous people. Zachary Running Wolf, first to take to the trees in 2006, thanked those participating in the Longest Walk for coming to honor the burial site and for their help in making others aware of the struggle in Berkeley.